Steve Smith has 41 receptions for 588 yards this season. The trade deadline in major league baseball comes two-thirds of the way into the regular season, and same with the NBA. In the NHL, it comes in early March, more than 80 percent of the way through the season. 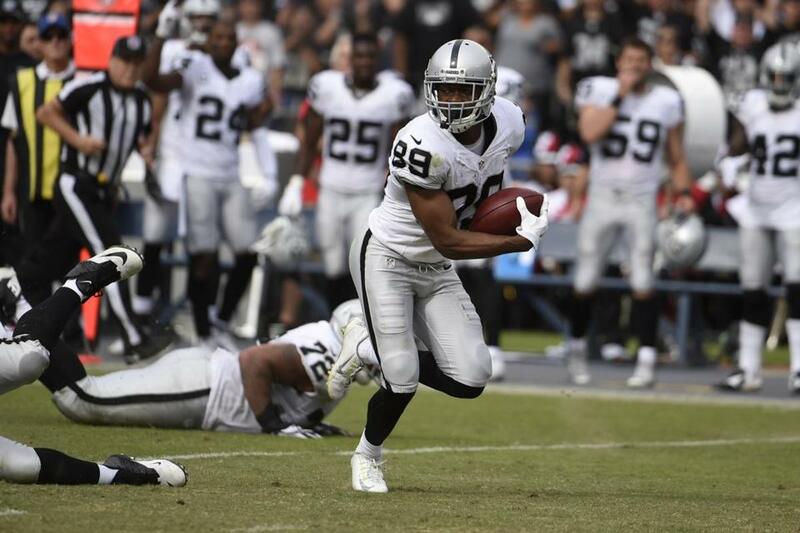 But the NFL’s trade deadline is this Tuesday at 4 p.m., 8½ weeks into a 17-week schedule. The NFL trade market isn’t nearly as active as the other leagues’ given the difficulty of implementing new players into a team during the middle of the season, and because most teams still have a shot at the playoffs (unless you’re the Ravens or Lions). But there are some intriguing players who could be on the move by Tuesday — or at least some players we’d like to see get moved so they can play out their final days with a playoff contender. And if any team is going to be active, it probably will be the Patriots, who swing more trades than any team and badly need help at cornerback and offensive line. So, with a big assist from OverTheCap.com, which has the details of every NFL contract, let’s take a look at potential trade deadline candidates, for the league in general and a few for the Patriots. 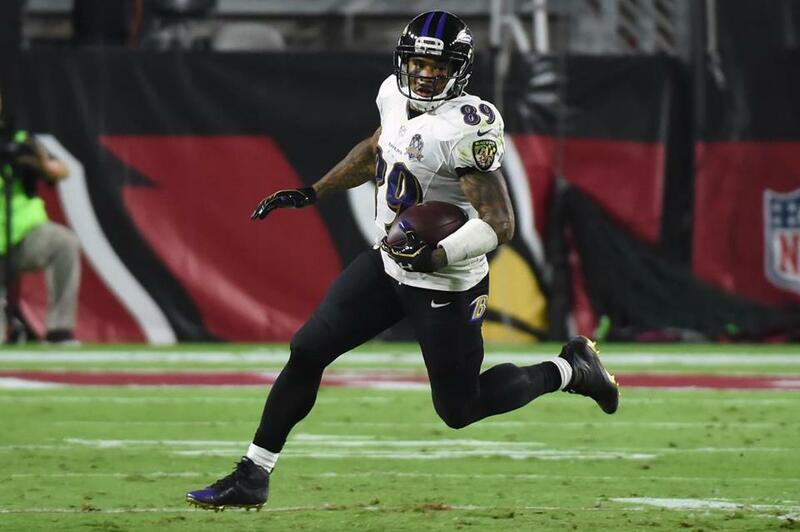 ■ Ravens WR Steve Smith — The 36-year-old said before the season that he will retire after 2015, and he seems to be sticking to it. We hope Smith reconsiders, because he might be the most entertaining player to watch in the NFL, and he is still getting it done, catching 41 passes for 588 yards and three touchdowns. But he’s languishing with the 1-6 Ravens and deserves to go out on a playoff team. You know who could use Smith? The Panthers! Another candidate on the Ravens is cornerback Kyle Arrington, who seems to have fallen out of favor in Baltimore. It will be a cold day in hell before the Ravens swing a trade with the Patriots, but the Patriots should try to find a way to get Arrington back for the stretch run. ■ 49ers WR Anquan Boldin, TE Vernon Davis, and RB Reggie Bush — The Niners are 2-5, just beginning a massive roster purge and rebuild, and should look to acquire draft picks for their remaining veterans. Boldin, 35, is another aging receiver who deserves better than to finish out his days on a team going nowhere, and could be of great help to a team like the Panthers or Vikings. Davis and Bush are in the final year of their contracts, making them attractive trade options for teams looking to play the compensatory draft pick game, although Bush’s durability issues may scare teams away. 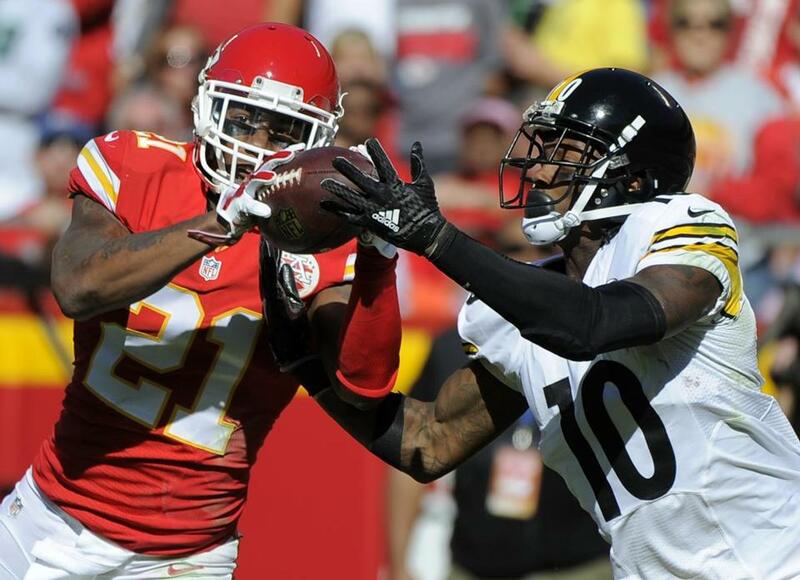 Sean Smith (left) has 13 tackles this season, but no interceptions. ■ Chiefs CB Sean Smith and S Tyvon Branch — The Chiefs are 2-5, and if they lose to the Lions Sunday, the Patriots should do whatever they can to pry Smith from their hands. Smith has been a bit of a knucklehead during his career, struggling with maturity issues during his first four years in Miami, then serving a three-game suspension this season for an offseason drunk driving arrest. But the Patriots have a pretty good recent history of getting knucklehead players to fall in line. And Smith, in the final year of a three-year, $16.5 million contract, would be a tremendous add for the cornerback-needy Patriots. He’s one of the tallest cornerbacks in the NFL at 6 feet 3 inches, and since he’s in the final year of his contract, he would potentially lead to a high compensatory draft pick if he subsequently leaves in free agency. The Chiefs would save $2.25 million in cap space by trading Smith, and the Patriots should try to make this happen. Branch, an eight-year veteran, would be more useful for a playoff team than the Chiefs if they fall out of the race. ■ Lions DT Haloti Ngata, DE Jason Jones, C Manny Ramirez, S James Ihedigbo — The Lions are all but out of it at 1-6, and should look to shed some of their pricey veterans, each in the final year of their contract. Their decision to let Ndamukong Suh walk in free agency, then trade for Ngata and pay him an $8.5 million salary, has to be one of the worst moves in recent NFL history. Ngata’s remaining $4.5 million salary is awfully high for someone with just one sack this year, but perhaps he would be a better fit in a different scheme. Jones could be a productive pass rusher for a contender, Ramirez can be a good depth piece on the interior offensive line, and Ihedigbo has been sparring with the Lions front office for a couple years about his contract, and this could be the time for the two to finally part ways. Alterraun Verner has 19 tackles and a half-sack this season. ■ Buccaneers CB Alterraun Verner — The Bucs are 2-4 and probably at least a year away from being serious playoff contenders. 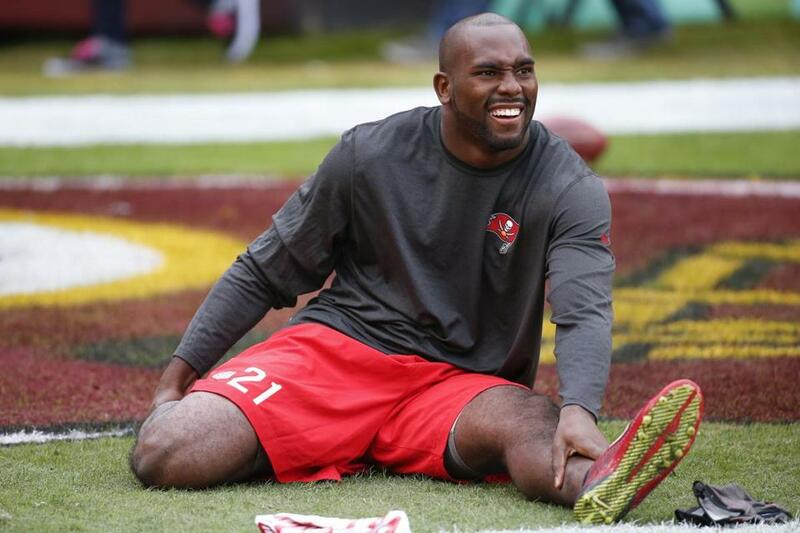 The Bucs and Patriots have been frequent trade partners over the years, and the Patriots should see if they can pry Verner and the $2.25 million left on his contract this year away from Tampa Bay. The Bucs have several veteran trade candidates because of the way they structure contracts — with large roster bonuses but no signing bonuses, meaning there is no salary cap charge if the Buccaneers trade them. One such veteran who also would look good in a Patriots uniform: Logan Mankins. The Patriots need offensive line help, and Mankins would cost a little more than $3.5 million for the rest of the season. ■ Bears DE Willie Young, LB Shea McClellin, S Antrel Rolle — The Bears are in the midst of wholesale changes on defense, with John Fox already shipping Jared Allen out of town as they switch to a 3-4 scheme. They should look to move some of their other veterans and misplaced parts for draft picks. ■ Jaguars DE Chris Clemons, TE Marcedes Lewis, QB Chad Henne — Free Chad Henne! The eight-year veteran will never be a franchise quarterback, but he’s a lot better than what the Texans, Browns, and Cowboys are trotting out these days, yet he’s languishing behind Blake Bortles. With the Jaguars 2-5, they should see what they can get for Lewis and Clemons, two veterans who present cap and cash savings and could be more useful for a playoff team. Troy Vincent’s comment to ESPN in June, criticizing the NFL Players Association’s decision to challenge several league rulings in court, seemed tone deaf at the time. Now it’s just downright laughable. The NFL continues to waste millions of dollars fighting against the union and Tom Brady, filing last Tuesday in US Appellate Court its 59-page opening brief challenging Judge Richard Berman’s decision to vacate Brady’s four-game suspension. And the NFL has beefed up its legal team in the process, hiring Paul Clement and two of his partners at Bancroft PLLC in Washington. Clement is the heaviest-hitting lawyer in the country. He was appointed by former president George W. Bush as 43d solicitor general of the United States, the person appointed to represent the federal government in cases heard before the Supreme Court, a position he held from 2005-08. Clement’s Bancroft bio states, “Mr. Clement has argued more Supreme Court cases since 2000 than any lawyer in or out of government” (more than 75 in his career). He was hired by the Republican Party to defend the Defense of Marriage Act and fight Obamacare. The New Yorker wrote that if a Republican wins the 2016 presidential election, Clement is a likely Supreme Court nominee. So, yeah, Clement doesn’t come cheaply. The NFL is rolling up its sleeves and getting serious about Deflategate. It’s no longer about Brady and football deflation, but another defining moment in the never-ending battle between the NFL and the NFLPA. The NFL believes that Article 46 gives commissioner Roger Goodell broad powers to discipline players for what it deems violations of the game’s integrity, and for not cooperating with investigations. The NFLPA and Berman obviously disagree. Most legal scholars are pessimistic about the NFL’s chances in appellate court — Berman’s decisions have been overturned about 8 percent of the time — but Clement didn’t take the NFL’s case just because he thought it would get his name in the papers. “The league’s brief was predictable but poses some interesting strategic challenges for the union,” said Suffolk University law professor and arbitrator Marc Greenbaum. “In any other case, there is a strong likelihood that the Second Circuit would accept the league’s position. Thus, the league’s brief virtually invites the union to argue that Goodell’s decision should be viewed differently because he is really the employer’s [NFL Management Council’s] representative, not an arbitrator as that term is usually understood. The NFL has earned more bad publicity over the last month, this time for fining players who have personalized their uniforms in an effort to promote a cause. Earlier this month, the league fined Steelers defensive end Cam Heyward more than $17,000 for wearing eye black adorned with “Ironhead,” a tribute to his father Craig Heyward, who died of cancer in 2006 at age 39. Last week, the Steelers had two players fined $5,787 for their messages: running back DeAngelo Williams, who has lost his mother and four aunts to breast cancer, for wearing “find the cure” on his eye black; and cornerback William Gay, whose mother was killed in a domestic violence incident, for wearing purple cleats in honor of Domestic Violence Awareness Month. I understand why the NFL has fined these players, and why it previously fined Brandon Marshall for wearing green cleats to promote Mental Health Awareness Month. If the league starts letting players personalize their uniforms, it opens up a Pandora’s box to allow every player in the league to use himself as a personal billboard. The NFL wants its players to look clean and uniform on Sundays, and I respect that. That said, these fines are incredibly callous, particularly because the NFL professes to care about stopping domestic violence and funding breast cancer research. So, we have two solutions that would make everybody happy. One, start honoring Domestic Violence Awareness Month. The NFL promotes the breast cancer awareness message loud and clear during October by inundating us with pink gear. What better way to prove the league is serious about its domestic violence issue than to let players wear purple cleats and towels, too? And two, allow players to apply to the league office for approval of personalized messages before the season. Make the players state the cause they want to promote, the exact nature in which they plan to do it (eye black, shoe color, etc. ), the exact weeks in which they plan to promote their cause, and the charity to which they will donate. This system would allow players to promote good causes, but do it in an appropriate and professional way. And instead of fining the players, put that money to good use via charity. More drama for the Patriots last Sunday against the Jets. What really happened? The NFL and the Jets claim that the pregame sweep of the visitors’ locker room for bugs was simply one of the league’s random checks. And as for the in-game questioning of Patriots employees, the Patriots are suspicious that the Jets asked NFL security to get involved, the Jets declined to comment, an NFL source insisted that the Jets had nothing to do with it, and then Pro Football Talk obtained an internal e-mail stating, “Jets security director Robert Mastroddi made an inquiry with NFL security regarding the presence of two individuals wearing headsets and Patriots attire.” Two sources who witnessed it told me they heard a Jets coach say, “We got that [expletive], cheating again.” NFL security found nothing and closed the matter. What to make of all of this? Seems like the Jets were trying to start some stuff with the Patriots, and for some reason the NFL is trying to help the team downplay its involvement. No team is the target of more unfounded rumors and investigations than the Patriots, but at least they’re getting inside the heads of their opponents. Extra points, Week 7: Kickers missed seven PATs last week, connecting on 61 of 68 (89.7 percent). Extra points, season: Kickers have missed 28 extra points, 20 more than last year. Kickers are 478 of 506, a 94.5 percent success rate. Jacksonville’s Jason Myers leads the NFL with three missed kicks, while 18 kickers are perfect, led by Stephen Gostkowski, who has made all 28. Two-point conversions, Week 7: After a couple of down weeks, teams converted 4 of 5 two-point conversions. Philip Rivers and the Chargers converted both of their attempts. 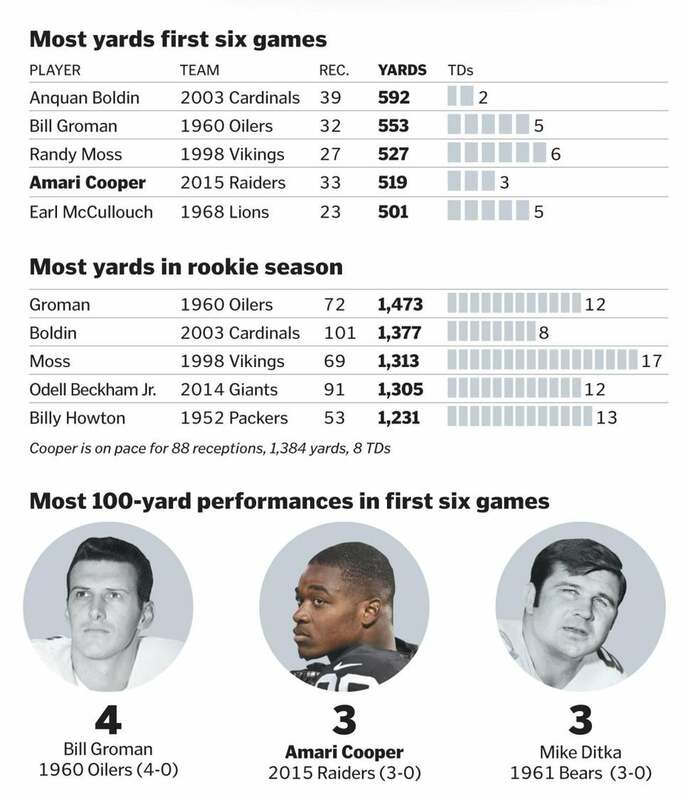 Two-point conversions, season: Teams are 22 of 46, a success rate of 47.8 percent. It’s almost the same success rate as last year (47.5 percent). But teams attempted only 59 two-pointers last season, and will shatter that mark this year. Time to close the voting for NFL Offensive Rookie of the Year. Rams running back Todd Gurley’s last three games: 19 carries for 146 yards in a win over the Cardinals, 30 carries for 159 yards in a loss to the Packers and 19 carries for 128 yards and two touchdowns in a win over the Browns. In just four games this season he has 442 yards on a 6.0 average. And he’s doing all this less than a year removed from a torn ACL. … Sunday’s Packers-Broncos game is only the fourth game all time between teams that are 6-0 or better, the last coming between the 8-0 Pats and the 7-0 Colts in 2007. … If Chuck Pagano is fired as Colts coach, he’d be a great fit at the University of Miami, which needs a new coach after firing Al Golden. Pagano coached DBs for the Canes in their glory days from 1995-2000, and his emotional/tearful/player-friendly style would play well with college kids.